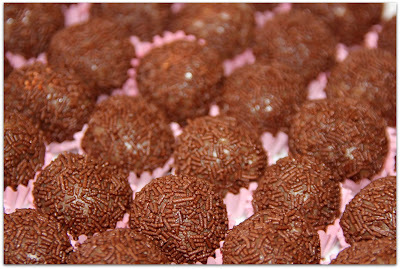 Brigadeiro is the most popular dessert in Brazil. Rich gooey yummy chocolate truffles that are obligatory presence in any child's birthday party. It's something imprinted in your childhood memories: I will always remember the fights I used to have with my brother and sister disputing who was going to eat the leftover from the pan and the best thing was to help Mum rolling them: one for the tray, one for me - perfect even division. A bit of history, the theory is that the sweet was created in the late 40's. Its creation is connected to the political campaign of army Brigadier Eduardo Gomes that was running for president. There are two versions of the story, one is that the sweets used to be served during his campaigns parties and other is that it used to be sold by housewifes to support his campaign. In any case, Brigadeiro means Brigadier as it was named after the politician (and no, it didn't work, he lost the campaign). 70 years later and one Viva! to the globalization, Brigadeiros are now starting to be popular in many places in the world. Personally I have been a bit anoyed with the recipes I saw in some quite famous (an not Brazilian) food blogs. I am Brazilian, borned and raised and this post is the real deal. Brigadeiro does not have Cream!!! The old Brigadeiro recipes used to have egg yolks but it is also optional; However, adding one yolk to the mixture gives it a better texture. Cream is added to make it softer to be used as cake filling and icing. Grease a large plate with butter and set aside. Place all ingredients except the chocolate sprinkles in a fairly tall and heavy bottomed pan - use a non sticky pan if you have one. Mix well all ingredients with a wood spoon before turning on the heat. Stir the mixture over medium heat for about 10-15 min. You will know when is ready when it "comes with the spoon" - basically you pull the mixture with a spoon and it takes time to go back. Remove from the heat and spoon it into the plate. Leave it to cool down at room temperature for about an hour. Don't put it in the fridge as it can get too hard. Serve then in small paper liners. Brigadeiro can be kept in room temperature for 3 days and they are better if kept out of the fridge! They last a week in the fridge and a month in the freezer. If you are not going to consume it in 3 days, freezing is the best option as it keeps better the taste and texture - before serving take it out of the fridge and leave it to defrost at room temperature for a couple of hours.